Composite Autoclave with PLC and unique medium circulation device for sale – Composite Autoclave manufacturer from china (104121257). 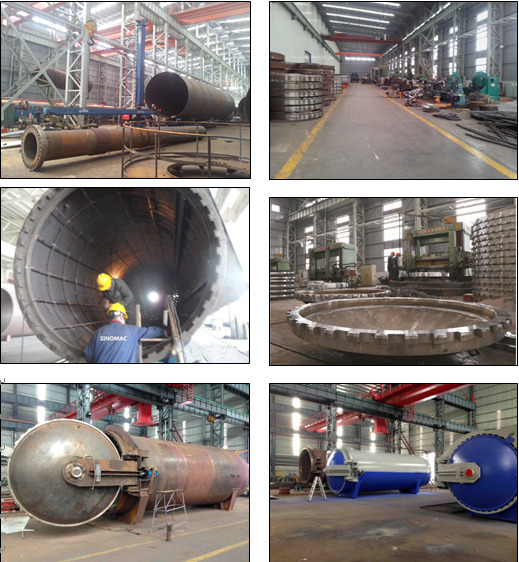 Jiangsu Olymspan Thermal Energy Equipment Co.,Ltd Your success is our success. Olymspan design and update the composite autoclave based on our own technology and knowledge from foreign countries. In the last ten years we have seen the evolution of new materials, with excellent mechanical and physical features. The mechanical resistance, together with the lightness of composite materials, are finding more and more applications. We call composite material the product obtained from the polymerization of carbon fibers and resins, adequately prepared and shaped overlapping coats of fibers and resin on moulds or cores. The autoclave is a key equipment for hot-pressing shaping of carbon fibers and resin matrix composites ( polyimide, bismaleimide, epoxy resin and thermoplastic resin matrices, etc. 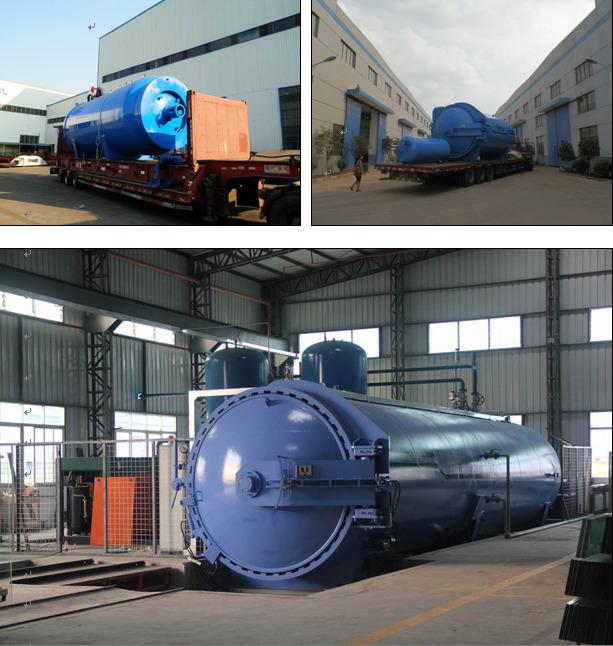 ), In fact, the quality of the product is obtained inside the autoclave reaching an increase of mechanical features up to 20-30% compared to other methods of polymerization, which do not foresee the outside pressurization of the product. The reliability and the precision of the cycles which can be obtained with SINOMAC autoclave, allow to reach and keep high quality standards of the product, which is widely used in the high-tech fields such as aerospace, automotive, electronics, weapon, traffic, sports equipments and new type of energy, etc. Definition: * Effective diameter is the workable diameter of the autoclave. * Effective length is to point to do the actual length of the composite material. OLYMSPAN Autoclave is a sealed pressure vessel which can be heated by a forced convection heating unit, where temperature, pressure and vacuum can be controlled effectively. 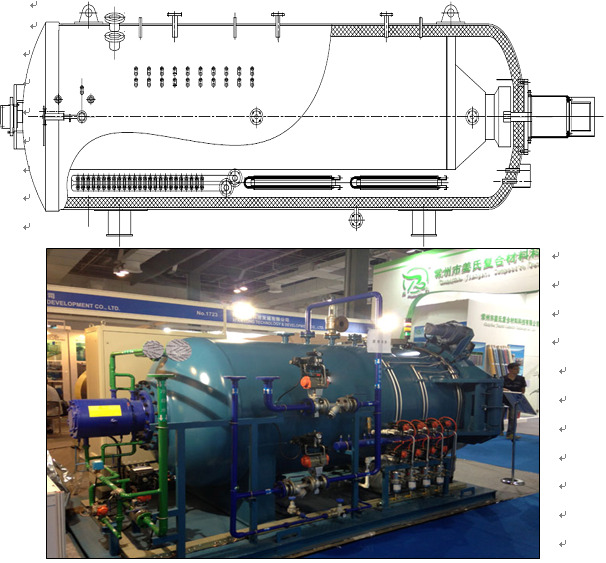 By means of an advanced design, consisting of a forced convection fun and motor unit, output heating power system can be adjusted 0-100%,proportional control of the pressurization, cooling and exhaust components. It can obtain an uniform temperature and pressure according to the process curve. Temperature is check in heating, keeping, and cooling phase. The heating/cooling gradients can be set by operator. Pressure is adjusted in pressurization, keeping, release phase. The whole working process of OLYMSPAN Autoclave has 17(or more) segments .In each segment, the value of temperature, pressure, vacuum and segment time can be set and monitored by HIM and PC, and the operation process will be realized by our exclusively developed software which is based on PLC control system to ensure the full automatic operation. 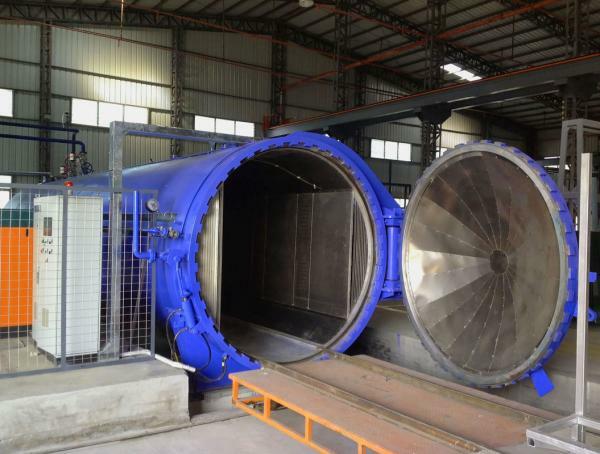 OLYMSPAN Autoclave is suitable for manufacturing various composite materials, and it also can guarantee the perfect product quality. (2) Start heating, Temperature rise to set point:Temp1, at the same time, pressurization, the pressure rise to set point: Press.1, and then starting the first keeping phase , the keeping time is the set point T1. (3) Completed the first keeping phase, continue to heat, the temperature rise to set point: Temp2, vacuum to Vacu2 or atmospheric pressure, and then began to start the second keeping phase, the keeping time is the set point T2. 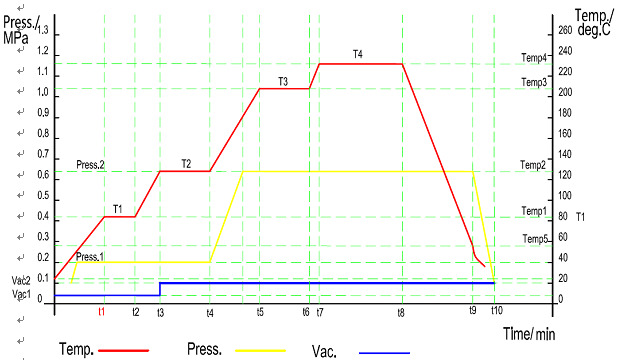 (4) Completed the second keeping phase,pressurization, the pressure rise to set point: Press.2. (5) Continue to heat, temperature rise to set point: Temp3, began to start the third keeping phase, the keeping time is the set point T3. (6) Completed the third keeping phase,continue to heat,the temperature rise to set point: Temp4,began to start the forth keeping phase, the keeping time is the set point T4. (7) Completed the forth keeping phase,began to start the cooling stage,Until the temperature dropped to set point:Temp5. You can save and choose different recipe. Ø Pressurization rate: 0-0.6bar/min average rate from 0 bar to max. working pressure. Ø De-pressurization rate: 0-0.6bar/min average rates from max. working pressure to 0 bar. Ø Heating rate: 0-3°C/min based on average air temperature from ambient to 250°C and autoclave with 800Kgs PCM and 1500kgs steel. Ø Cooling rate: 0-3°C/min based on average air temperature from 250°C to 50°C and autoclave with 800Kgs PCM and 1500kgs steel. Ø The whole system consists of four parts: a pair of gear flange, driven devices, seal ring and high temperature protection system. Ø Hydraulic operated door opening, closing and locking. It is controlled by PLC system. Ø The seal ring is made of silicon rubber, high temperature resistance. Ø It can be manual operated by the switches on the electrical cabinet near the door also. Ø Rail loading:4000kg,Increased loading can be offered optionally. Ø Floor loading::400kg,Increased loading can be offered optionally. Ø The heating system consists of three heating zones and the heating elements located in the bottom of the vessel for easy maintenance. Ø Multiple banks controlled via thyristor SCR. Ø Proportional control, 0-100% output. Ø The heating process is controlled by temperature controller, the mode is PID control, and it is organized by PLC system. Ø Inlet and exhaust valve, proportionally controlled, electro-pneumatic adjustable ball valve. Ø Manual exhaust valve, 3-piece ball valve. 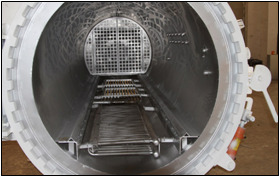 Ø The heat exchanger is located in the bottom of the autoclave for easy maintenance. Ø Stainless-steel heat exchanger, all internal wetted parts stainless-steel. Multi-row finned tubing. Ø Proportionally cooling valve for main cooling control. Ø Air spray and Mist water valves for pre-cooling control. OLYMSPAN composite autoclave is different from the conventional autoclaves. It does not require a radial air-duct and instead utilizes the floor as the forward air delivery system. This unique design features decrease the cost for customer, and make the temperature more uniform. The motor is bolted to the body of the autoclave, it drives the fan directly. Fully sealed special motor, bearings with SKF high-temperature series. The structure is easy to maintenance. Working use of water cooling, the shaft water cooling with separate water pump and flow switch to be fitted to monitor water flow and automatically alarm/stop the cycle if there is not enough water flow. Type-K, including PC monitoring, data-acquisition, and control. Ø PC-controlled vacuum select valve, 3-piece ball valve, stainless-steel. Ø PC-controlled vent-vent select valve, 3-piece ball valve, stainless-steel. For composite curing applications with high volatile content (ie. high-temperature polyimides), the vacuum filter will be much more effective condensing volatiles and solvents during high-temperature curing operations. 4-11-7 Each vacuum source individually controlled, it can be done vacuum and vent. And each will be individual shut off in case of vacuum bag rupture. 4-11-8 Separation of vacuuming and measuring. 4-11-9 Automatic vacuum leakage test before start a circle. Lightning throughout the autoclave working area, it is 400 lux. 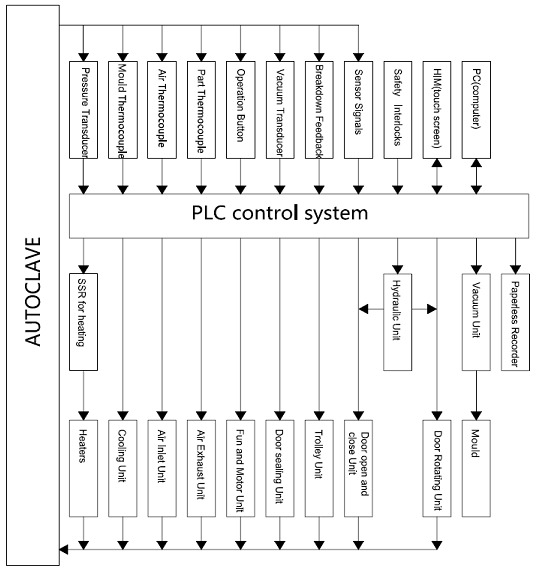 Ø The Control System is developed based on the research and development toward composite material field, and it is made up of one PLC for the automatic managing of the process and one PC for the supervision of the system. The operation of the whole system is based on the exclusive developed software package-TPC(Thermal processing control). Ø Password protected entry access, operator can log into the system by accessing the security login form with a name and password. Ø Full automatic operation including heating, pressuring, vacuum, vent, cooling and exhaust actions. Monitoring and display run status information, data saving information, integrity check information and run override controls, such as change segment, end run, etc. Ø Manual operation screen allows operator take manual control temperature, pressure, vacuum, fan, and valves as allowed. Ø According to the different working process requirement, it can set segment time, control TC, temperature value, temperature rate, vacuum value, pressure value, pressure rate, etc. 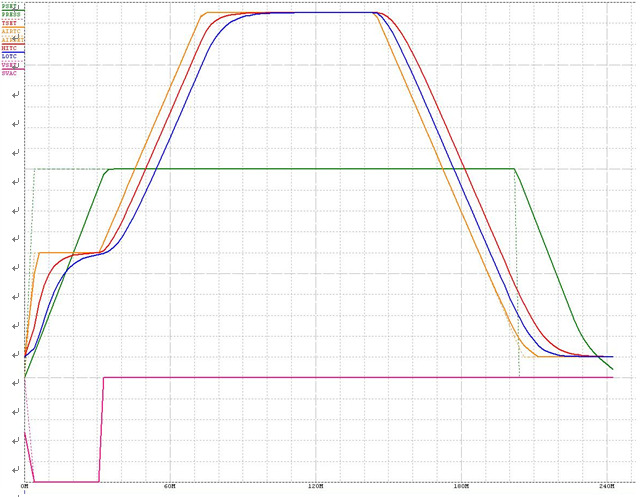 before curing, and it also can modify the parameter on live operation. Ø It can choose and save the different curing recipe, display a real time and historical trend of the pressure, vacuum and temperature; storage all processing data and its paperless record function can realize reporting of working curve and process parameters. Ø It can monitor all actions of devices and the safety system information continuously, such as safety interlock, door closed, door locked and so on. Ø It has audible and visual alarm system and diagnostic and fault finding screen, including over-temperature and over-pressure alarm and various safety protection functions, such as vacuum leakage, over cure cycle deviations, component failure, etc. Ø Heating control will allow operator to control from product or air or minimal T/C reading, the TPC has control TC, operator can choose air TC, High TC, or low TC. 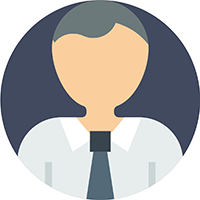 Ø Customer can operate register, login and typing in product information, and realize intranet or remote control. Ø It can realize data output, printing, analyzing requirements to improve product quality. Ø Mechanical and electrical interlocks for door closure, door closed and locked proof of position, the autoclave can not be opened when pressure in the autoclave higher than 0.2 bar. Ø It will be auto-alarm when facing over-temperature or over-pressure; auto drop the temperature when over temperature, and auto-release when over pressure. Ø It has emergency valve for pressure release. Ø Circulation fan motor tripped indication. Ø Audio visual alarm when door opening closing is in operation. Ø Emergency stop push button to abort the cure cycle all pressure control valves, depressurization control valves, main cooling will fail to safe. OLYMSPAN autoclave will be primed and painted high-gloss "Dark Blue" color. Customer requested color can be quoted optionally. The autoclaves components and sensors will be monitored and controlled by the TPC control system. TPC is the Windows XP/Win 7 version of OLYMSPAN’s computerized control software. Most will agree that in the world of composites manufacturing, the control system is a key component to assuring autoclave performance, usability, and reliability. Even the best autoclave will be crippled by a poor performing control system, especially when processing large volumes of composites. Because of this fact, OLYMSPAN has focused a large portion of our R&D efforts on our control software and the features/capabilities that can improve processing performance, reliability, and lean manufacturing in autoclaves. The following screen images are provided for a typical OLYMSPAN composite autoclave implementation. This section includes water pump, cooling tower, water tank, filters, valves and pipes. 7.4.1 Platform device is used for the loading trolley, it can be moveable. 7.4.3 Valves , pipes ,flange, gasket and all material for installation of autoclave. Ø Heater : Electric heating inconel tubular heaters. 9-1. The equipment will be properly packed / wrapped considering long-distance ocean and land transportation and rough handling that may happen in the absence of both parties. 9-2. Proper protection from moisture, rust, mold, scratches, shaking, etc, will be taken so that the goods may arrive at the installation site in good condition. English) will be soundly attached, to the outside of the packing. The delivery period is 80 days after receiving down-payment; but does not include shipping time! 10-2-1 The installation and commissioning takes 1 person x 20 days (max.) under Buyer’s assistance. Production training is carried out during the same period. 10-2-2 The international travelling cost, including round-trip air tickets, insurance, boarding and meals of the Seller’s service team should be charged to the buyer. The Seller provides 14 months quality guarantee, during which the Seller is responsible for all equipment failures due to inferior quality, improper design or services. 1. 30% of total value will be paid by T/T as down payment. 2. 65% on submission of approval drawings by T/T OR LC. Alternate terms may be considered, though modification of terms may affect overall price of system. 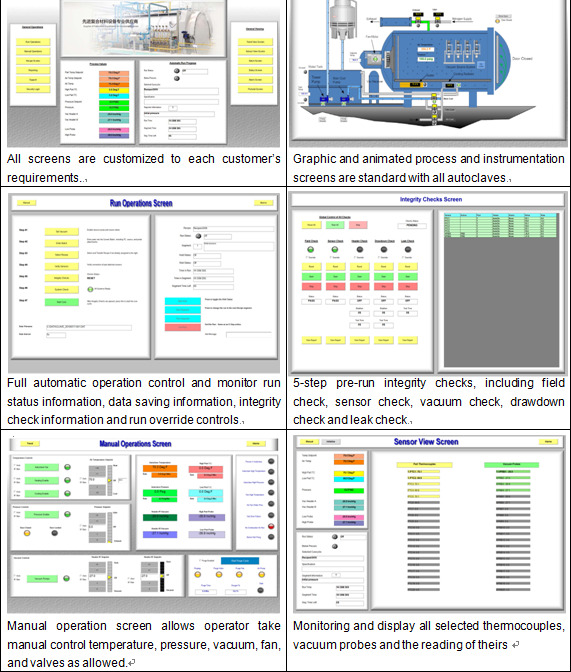 Provide relative technical data for customer choosing equipments. Design floor plan, basic general drawing and quotation. After the contract working, we will execute each item and keep relevant standards strickly in every manufacturing process. Keep in touch with customer and make sure that craft, quality and technology could meet the requirements. Help customer for installation and training at site. Maintenance and repair for one year. Customer should pay for the round-trip flight ticket and accommodation. 14. More terms and conditions will be explained in the final contract.